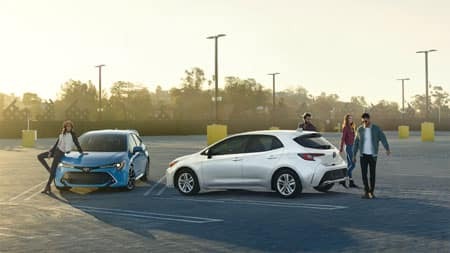 With roots tied to the Corolla iM, the all-new Toyota Corolla Hatchback combines the practicality of a hatchback design with eye-catching styling and potent performance. An all-new suspension, 2.0L Dynamic Force Engine, and Dynamic Shift-CVT with paddle shifters help invigorate your commute. Available Sport Seats and a 6-speed Intelligent Manual Transmission also add another dose of adrenaline. 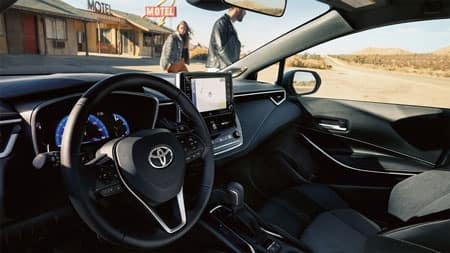 Designed around the driver, the interior of the Corolla Hatchback offers innovative tech features including Apple CarPlay® and Amazon Alexa smartphone compatibility to keep you connected no matter how far you travel. 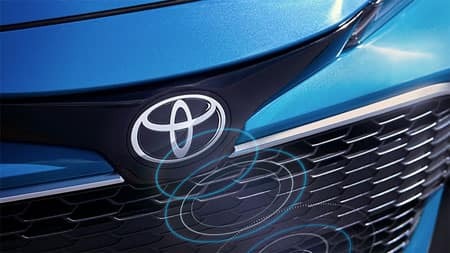 Enjoy the security and confidence from knowing your protected from the unexpected thanks to standard Toyota Safety Sense™ 2.0, offering a collection of advanced driver-assistive safety features. Bold, expressive exterior colors include Blue Flame and Scarlet to let your Corolla Hatchback reflect a personality as unique as your own. Instantly recognizable on the road, the all-new Corolla Hatchback offers charisma and character not found in many hatchbacks. Striking design elements include distinctive LED headlights and taillights, chrome tailpipe diffuser, chrome grille surround, and available 18-inch alloy wheels. Offering more than a sport-infused appearance, the practicality of its 5-door design offers greater versatility which comes in handy when packing for your next adventure. You’ll find an array of colorful hues offered on the exterior to help create a personality as vibrant as your own. A signature rear spoiler adds another eye-catching complement to the rear of the Corolla Hatchback. Never compromising on comfort and technology, the interior of the Toyota Corolla Hatchback offers a versatile yet spacious environment for drivers and passengers to enjoy. Upscale design elements include contrast stitching on the dash and doors, soft-touch materials, and premium piano-black accents. Optional dual-zone climate control and leather-trimmed heated sport seats add even more luxury. A massive 8-inch touchscreen serves as your hub for infotainment and houses the standard Entune™ 3.0 Audio system. You’re able to use the power of your iPhone® on every drive thanks to standard Apple CarPlay® compatibility. An available Entune™ 3.0 Premium Audio with JBL® w/Clari-Fi™ features 8 speakers to help you hear your favorite tunes in a concert-like setting. A standard Smart Key System allows you key fob to sit comfortably in your purse or pocket, giving you the ability to lock, unlock, and start the vehicle with a push of a button. From the moment you step on the gas, the standard 2.0L Dynamic Force Engine gets your adrenaline pumping with a total of 168 horsepower. A low, lightweight body combined with a completely new suspension lets you enjoy every mile of twisty back roads. A standard Dynamic Shift-CVT features paddle shifters mounted on the steering wheel. Looking to row your own gears? An optional 6-speed Intelligent Manual Transmission (iMT) offers intelligent rev-matching feature for precision downshifts. Standard Toyota Safety Sense™ 2.0 (TSS 2.0) provides extra reassurance that you and your passengers will stay out of harm’s way. Examples of technologies included in this comprehensive safety suite are Full-Speed Range Dynamic Radar Cruise Control (DRCC), Pre-Collision System with Pedestrian Detection (PCS w/PD), Lane Tracing Assist (LTA), and several others. Toyota continues its commitment to building some of the safest vehicles on the road with the Corolla Hatchback. **2019 Corolla Hatchback XSE with automatic transmission preliminary 30 city/38 hwy/33 combined mpg estimates determined by Toyota. EPA ratings not available at time of posting. Actual mileage will vary.